This is a fantastic toy and a great price. My 5 month old twins love it. Great for teething, lights up, easy to press button, and plays 3 songs. Loud enough to hear, but not overly annoying. No off button, just plays when pressed. My five-month-old son started noticing this toy around 5 weeks. The high-contrast handle and lights and music caught and held his attention like nothing else at that age. Once he started swiping at things with his hands, he was able to move the ball spinner and seemed to enjoy seeing his effect on the toy, as well as watching and hearing the balls spin around. 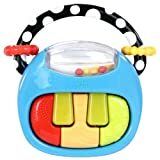 As he’s grown more coordinated, he is using this toy even more, and can now deliberately move the beads, teethe on the handle, spin the balls, and push the buttons to make music and lights come on. This inexpensive toy looks so simple, but it has so many uses for your little one. I like the bright colors, and the five different tunes it plays with coordinating light-up keys are of nice sound quality. This is our favorite post-bottle-morning-laptime toy, and I recently bought a second one to take with us when we are out visiting. I looked at several other brands of similar toys and believe this one offers the most, developmentally.